Yesterday was a painful day for my sweater. 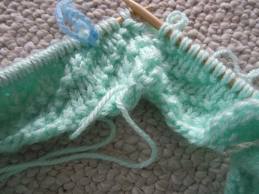 I had knit up the yoke and I knew it wasn't turning out right. 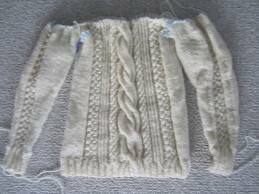 It ended up being WAY to wide along the neckline and not anywhere near the shape I wanted. If I had been smart, I would have put a lifeline in when I joined the sleeves, but I didn't. Instead, I had to precariously rip back to an inch after I joined the sleeves. I then put it on scrap yarn. I know to get the look I want I need to incorporate short rows in the back, but I haven't quite figured out how to do that yet. I'm going to try to finish it before I go to Spain, but I'm not sure if that's going to happen. 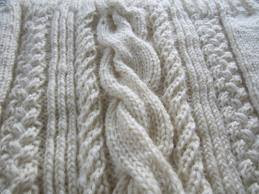 Though I am full of disappointment about this sweater right now, one thing I am happy with is the cabling. It's incredibly soft and warm. This sweater has been occupying my size 10 circulars, so I am happy (and needed) to take a break from it and work on something else. This is the swatch and the beginnings of another infinity scarf. I'm very excited about the color (in person, it's a very subtle mint color). I'm hoping to post the free pattern for it soon! 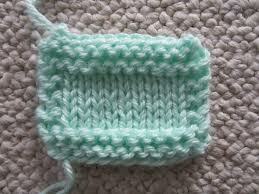 Wow, that sweater is coming along beautifully! It's a good idea to take your time getting the yoke right. It will be worth it! I definitely understand your need to take a break from it though, and I think doing so is wise!